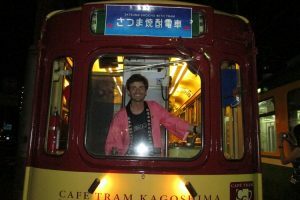 All aboard the Shochu Tram! The evening’s crowd included guests from nearly a dozen different countries. 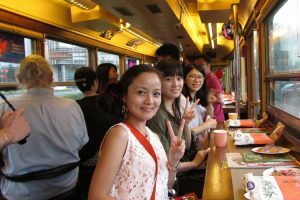 The main organizer of the opening night of this year’s Shochu Train was Okuchi Distillery, makers of “Kuro Isanishiki,” the best-selling sweet potato shochu in Kagoshima Prefecture. 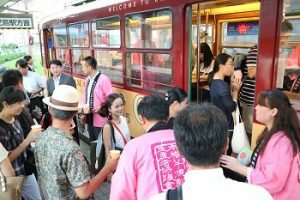 Okuchi Distillery representatives were joined by executives from the prefecture’s largest shochu distributor to pour drinks for 24 lucky international guests hailing from nations such as Myanmar, Korea, China, Taiwan, the United Kingdom, and the United States. Although Okuchi Distillery was the main organizer of the evening’s festivities, shochu from more than a dozen distilleries were freely available to all in attendance. 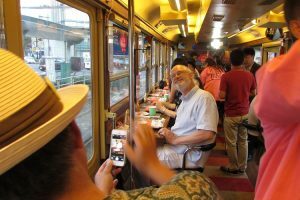 It was a veritable all-you-can-drink experience, an incredibly common occurrence in Japan. All the guests needed to do was ask a pink happi-clad staff member for a recommendation, and a fresh drink would soon arrive. Don’t worry, he wasn’t allowed to drive. Okuchi Distillery’s Koichi Yamada gives a brief shochu history lesson. Chris Tow wins some free shochu! This article, authored by Christopher Pellegrini, originally appeared in the 2017 edition of Zipangu’s shochu magazine. It is reprinted here with the permission of the publisher.